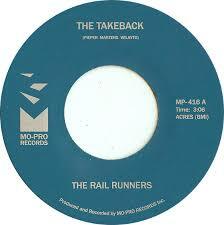 The Great Adventures Of Darrell D.
The Rail Runners "The Takeback" is BACK! Back in 2012 while visiting family in Battle Creek Michigan, I took the 2 hour drive up to Detroit to visit one of my favorite record stores, Peoples Records. Those that have been to Peoples know that they are the capital for funk and soul 45's and it's nearly impossible to leave without a handful of gems to add to your mini record boxes. Now usually I find rare funk from days past and this trip was no different, but I also picked up a "new" release from a group called The Rail Runners. After dropping it on at the listening station, it took me about 5 seconds to realize that I was going to need 2 copies. For years to come, whenever I spun this record at a party, no one seemed to know of it, but everyone loved it. I can't front, I dug how it felt as if I was the only cat around with this hidden gem and I got a kick out of rubbing it in the faces of all the other 45 jocks, I mean who wouldn't??? 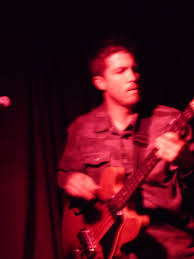 Well recently, and just by chance, I connected with Ryan Pieper, the bass player and frontman of The Rail Runners. After "geeking" out a little about how much I dig his record, he agreed to bless me with an interview and tell me a little more about himself and this cool little 45. Darrell D - How did you become a musician? Ryan - I spotted a Gibson Ripper bass in a pawn shop window circa 1993, it was the exact same model that Krist Novoselic was using in Nirvana at the time and I totally gravitated to it. It was only $250 but still a lot of money to me back then. I then formed a punk band with some friends in middle school and I still have the demos we recorded on a boom box. D - What musicians have inspired you and why? R - Vic Chesnutt and James Jamerson. Those guys are at complete opposite ends of the spectrum in terms of music. However, I appreciated Vic's verbal vocabulary and James' melodic vocabulary. D - What was the first record you ever bought? D - How did The Rail Runners form? R - Craigslist. For real! I've met so many great players this way. Also a lot of oddballs too. D - Why funk music? 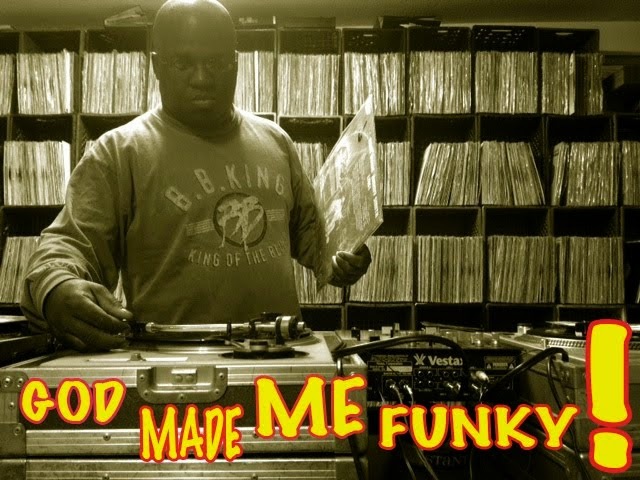 R - I was already a DJ / Funk 45 collector and I had been wanting to be in a band again. ...As a bass player it is pretty fun to play. 'Hot Pants Road' by James Brown is a favorite of mine to play. Fred Thomas who is on bass, is able to keep this delicate balance between 'tight' and 'loose' at the same time. That early 70s line up was the best version of the JBs. D - What's your favorite funk record? R - Tough question, but "Slapping Some Soul Upon Me" by Little Jimmy Edward is pretty awesome. It packs in so much and is under 2 minutes long. D - What's the backstory on the recording of "The Takeback/Crash Burn Learn" 45? 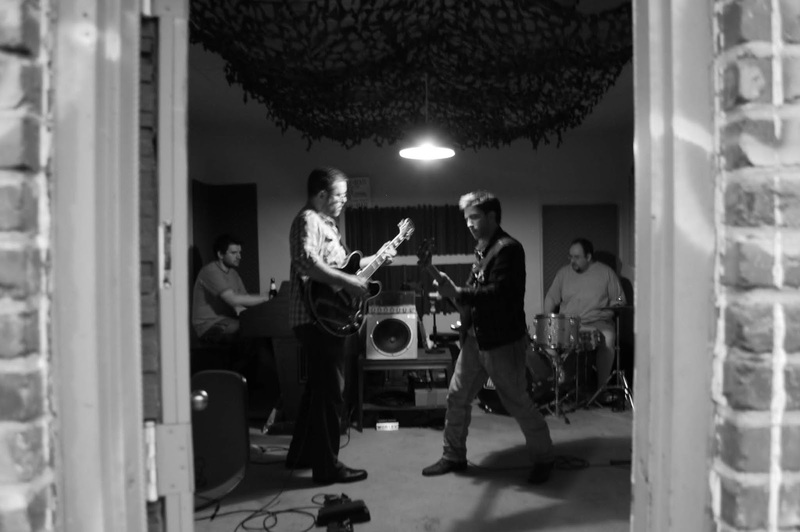 R - We recorded 6 songs onto a Tascam 4 track cassette Portastudio. Everyone had one mic, including the drummer, which was a bit tricky to dial in. I used the same pawn shop Gibson Ripper I've had since I was 13 and ran it through an Ampeg B15. 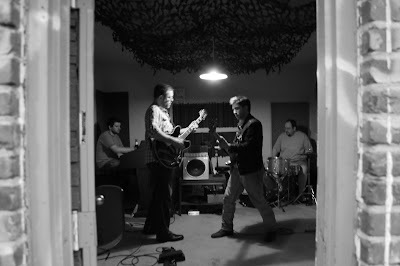 The guitarist had a 335 type hollow body and the organ player used a real Leslie cabinet. The drummer played an old Ludwig kit and used a 1930's Leedy snare on Crash Burn Learn, I thought it had a nice deep sound. The cassettes were then mixed down to 1/4" tape at Inner Ear Studio (Arlington VA), mastered at Nashville Record Productions (Nashville, TN), and then pressed 300 copies at Archer Record Pressing (Detroit, MI). Needless to say, this little record got around. We went through the headache of using strictly analog gear though out the entire process. It was partly for sound and partly for the challenge of doing it that way. Was it worth it? I'll let the listener decide. Either way, we had fun making it and really appreciate DJs like yourself who include it within their sets. Thanks! D - Was it a conscious decision to include a "break" on the "Takeback/Crash Burn Learn" 45? R - Probably. You (usually) cant go wrong with some open drums. D - What's the weirdest thing that has happened to you while performing? R - I remember a fight breaking out at one of the dive bars we played. We honestly didn't know if we should stop or keep playing. We kept playing. D - Besides music, do you have any other hobbies/interests? R - I enjoy restoring old instruments and tube amplifiers that probably should be thrown away. Recently I reset the neck and added a p90 (pickup) to a '67 Silvertone archtop. ...now I just need to learn how to play guitar. D - Where can this 45 be purchased? Once again it's on! 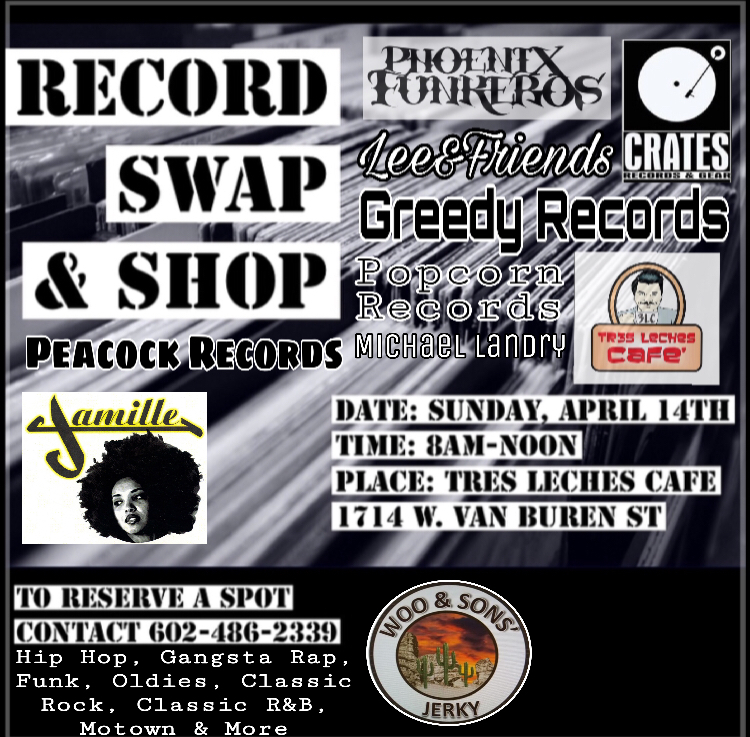 The place is Tres Leches Cafe on 17th ave & Van Buren for their very first Vinyl Swap Meet & Record Show. Sunday April 14th, 8am-Noon and admission is free! I'll have lots of rap 12", some soul Lp's, 45's, a collection of Library Lp's, concert t-shirts, & mixtapes. 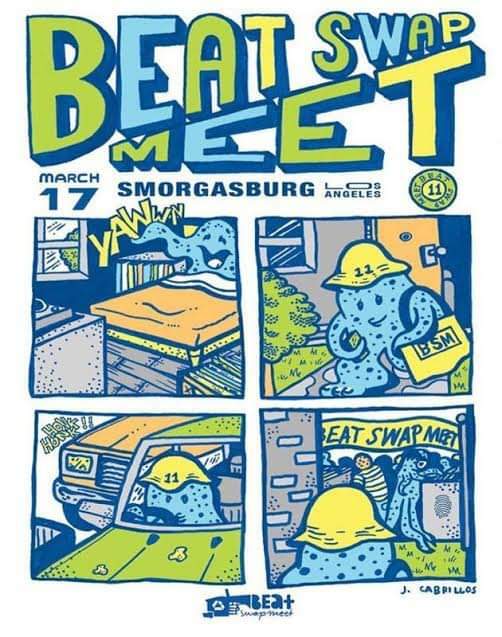 Get their early so you can grab the good stuff. SCORE! Picked up this sweet little nugget from some defunct record store dead-stock. This classic from the early 70's is a sweet addition to my art collection. As soon as I can get this beauty in a frame it's gonna take up some prime real-estate on my wall. This is the man. The MAIN man. Robbie A.K.A. Utmost has been bringing us the illest record show/hip-hop festival in the country for 11 years strong. I want to personally thank you for all of the invites, good times, and access to some of the illest records i've been able to add to my already "too large" vinyl collection. Thanks again brother. This is John. He's Robbie's right hand man. John makes sure that all of the acts and stages run smooth. The BSM would not be the same without him. Thanks brother! In addition to having the official Sputnik Brown "U Havin Fun Yet?" record release party at the BSM, Mc Oxygen also performed the single and a few other rap gems. 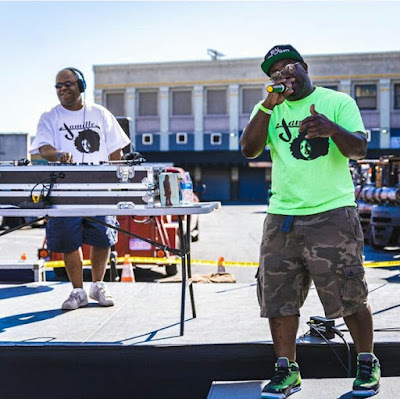 The "Gone Diggin" emcee appeared at the Jamille Records booth for a meet and greet with fellow diggers and fans alike. Gentleman, Dj , Park Ranger, Choreographer, Crossing Guard, Collector of all things funky! Chics dig me, Haters love me. Check my Style out!